Annis Boudinot Stockton lived with her husband Richard Stockton, a noted attorney and signer of the Declaration of Independence, in their home called Morven near Princeton, New Jersey. Born into a well-to-do Huguenot family, Annis was well educated and acquired a reputation as a poet—she had 21 poems published during her lifetime, including odes to George Washington, whom the Stocktons counted as a friend. Since Princeton was in the path of invading and defending armies Annis and her family were forced to flee to a safer location in 1776. It was in Monmouth, New Jersey, that her husband was captured by Loyalists. He was held prisoner and, contingent upon his release, was compelled to take an oath to withdraw from politics, a commitment which he honored. When the British occupied Princeton in 1777, General Cornwallis made Morven his headquarters; his troops ransacked the property and destroyed important papers as well as one of the most important libraries in the colonies. Annis survived her husband, who died of cancer in 1781, and remained active throughout her life. See other posts related to Stockton here, here, and here. Morven, having been home to five generations of Stocktons and five New Jersey governors, is now a National Historic Landmark (2004). Currently on exhibit until March 29 is a collection of some 30 samplers by girls, generally between the ages of 8 and 16, entitled: “Hail Specimen of Female Art! New Jersey Schoolgirl Needlework, 1726-1860”. It was a mark of social status for girls during the seventeenth and eighteenth centuries to become skilled at needlework. 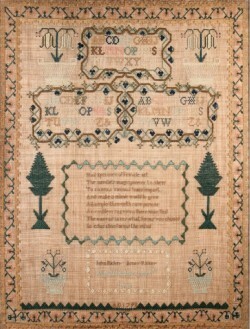 Pictured is the sampler created in 1798 by Anne Rickey, when she would have been about 15 years old. The first line of the poem provides the title for the exhibit. Read a New York Times review of the exhibition HERE.